When I purchased my copy of The Well-Trained Mind three years ago, I thought I would never be interested in The Well-Educated Mind. I thought I would be reading right along my children as we followed suggestions from The Well-Trained Mind. Who would have time for anything else? I was wrong. Not that I find myself with “vast chasms of time” on my hands, to use Thomas Jefferson’s expression. But I got my kids on track with their assignments from The Well-Trained Mind and now I find myself curious, hungry, and eager for filling in the gaps in my own education. When I heard The Well-Educated Mind was being revised and re-published in October 2015, I placed my pre-order in September and waited (im)patiently for it to come out. Right from the introduction, I was very impressed. The book offers tremendous information about how to read a book. I read How to Read a Book by Mortimer Adler last summer and learned a lot, but The Well-Educated Mind offers more precise advice, better organized ideas, and information geared specifically toward the homeschooling parent. Sorry, Mr. Adler! I have already started down the list of 32 novels, which are listed in chronological order and have been chosen for their meaning in the history of novel evolution. 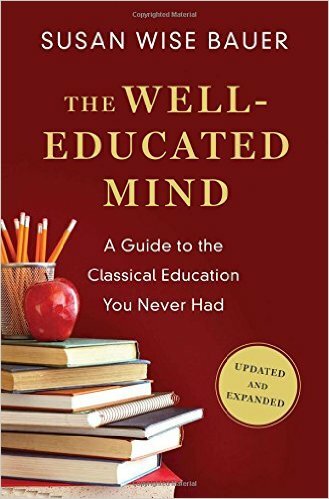 I keep The Well-Educated Mind nearby and refer to it often, as I am still learning how to mark each book and how to read it on the three levels of classical education. And while I do not have the time to do everything Susan Wise Bauer recommends, I think I follow 90% of her suggestions in this book. I had the older edition at one time, but gave it away. I think I need to get it again!